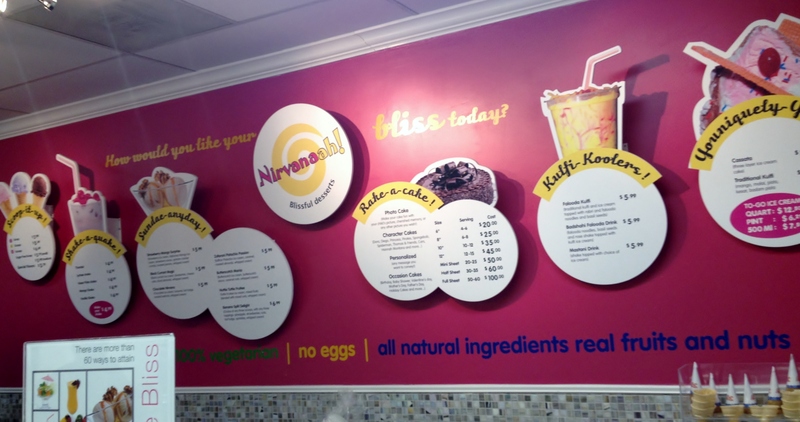 It was ages since I had a kulfi (Indian ice cream), until I went to Nirvanaah (meaning Pure Bliss) in Sunnyvale, California. I had heard that Nirvanaah, serves kulfi and ice creams in flavors that one would, typically, find only in India. When I made a trip to the San Jose / Mountain View area, I had to make sure that I would have a few minutes at Nirvanaah in Sunnyvale. I was in the San Jose / Mountain View area for my under-graduate re-union (let’s just call it the “nth” year re-union, you can choose whatever number for “n”). At the end of an exciting, sleep-deprived weekend of catching up and socializing with many friends – some close, many long-lost – I was meeting my cousin in Sunnyvale on Sunday evening / night. We decided to get some food and dessert as take-out as there were more people at home. This post is all about the dessert – from Nirvanaah, in Sunnyvale, CA. Note: Yelp reviews caution that one should not expect the Haagen Dazs type ice cream from Nirvanaah and one who is not familiar with the kulfi will do well to heed such cautionary advice. The kulfis are indeed different from regular ice creams. Kulfi is an Indian dessert made from concentrated milk (boiled down to a thick consistency), nuts (pistachios), and spices (cardamom / saffron). It is quite different from a regular ice cream / frozen yogurt / gelato available in Western countries. This Wiki entry says that Kulfi is denser and creamier than regular ice cream and that it takes longer to melt, but that is not the case, in my opinion. It certainly has a different texture compared to ice creams / gelatos – I think kulfi has a gritty texture because of the nuts and a flaky texture because of the tiny, ice crystals formed while freezing, perhaps because it is not whipped as an ice cream is. At Nirvanaah, I was very excited and thrilled to see so many Indian kulfi flavors and ice creams – Mango kulfi, pista kulfi, badaam (almond) kufi, elaichi (cardamom) kulfi, maawa (also called khoa / Khoya – milk boiled down to reduce its moisture content) kulfi, and chikoo (Sapote / Sapota in English), custard apple (sitaphal in Hindi), and many more. Nirvanaah claim that their ice creams are vegetarian, i.e., egg products are not used. But then, I did not know that eggs / egg products were used in ice creams. Are they, really? Back to Nirvanaah, after trying out many flavors, we decided to take home the Maawa Kulfi and the Chikoo ice cream. Maawa Kulfi – This was absolutely divine – with its rich, creamy texture (yet very kulfi-like), with bits and pieces of some nuts (Pista / almond), with a mild cardamom flavor, and sweet, but not cloyingly sweet. Have I had better kulfi and chikoo ice cream elsewhere? Certainly, but back in India. The kulfi at any of the kulfi places near Wilson College, on Marine Drive in Mumbai beats the kulfi at Nirvanaah. 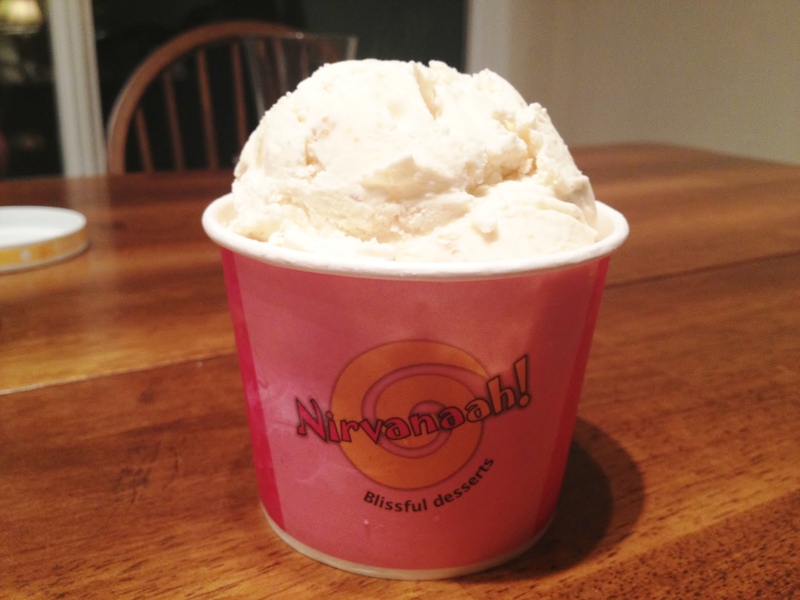 But, if you can’t go to Mumbai or elsewhere in India to find kulfi, then, Nirvanaah is the place for you. The Chikoo ice cream from Natural Icecreams was richer, creamier, and tasted more of the fruit than the one from Nirvanaah. If you have never tried it, you must try at least a couple of flavors of Natural Icecreams – their ice creams are apparently made with no stabilisers, preservatives, artificial colors, or chemicals. They are present in many cities in India – as far South as Cochin, and as far east as Raipur. 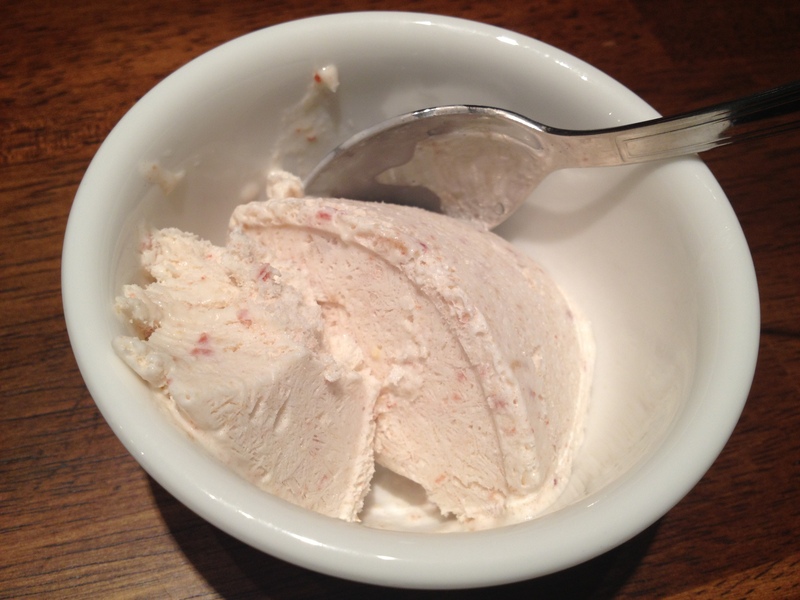 What are some of your favorite flavors there – Kulfi and otherwise? Did I miss the most exciting flavor there? Or better still, have you had better kulfi elsewhere (i.e., outside India)? If yes, where ?